The holiday home Bovenwiede has a waterfront location in the old town of Giethoorn. Sailing the boat, a punt boat, on the canals of central Giethoorn or explore the waters of the Weerribben-Wieden National Park. Step from the garden into the punter and sail directly to lake Bovenwiede, on your way you will pass several islands with sun and swimming possibilities. In the garden with lots of privacy you forget that you are staying in the old center of Giethoorn and gives you the holiday feeling. Giethoorn is because of the bridges and water known as the Venice of the North. The century-old farmhouse has a cozy living room with a high ceiling and has the atmosphere of that time, the patio doors to the terrace complete the picture. On the dinner table you can enjoy dinner with you family or friends. Three bedrooms are equipped with boxspring beds and the fourth bedroom has a single bed and a loft bed. In the bathroom you can relax in the jacuzzi or the walk in shower. A few minutes walking distance you will find several restaurants, bars, authentic farmhouses, museums and galleries. 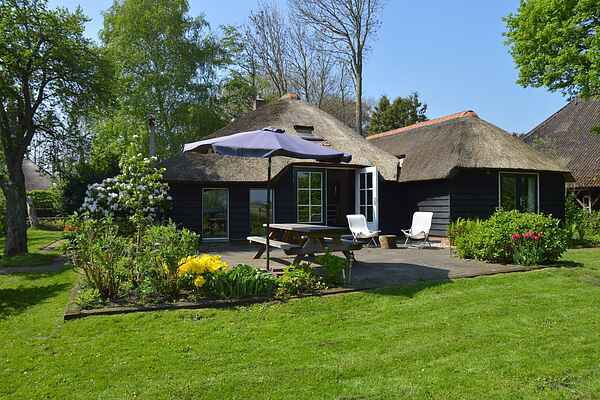 This holiday home with free boat has everything to explore Giethoorn and it's nature. Attention: The house is not accessible by car. You can park for free in a large parking area and in a few minutes walking you arrive at the holiday home. the boat can only be used between March 1st and November 1st.